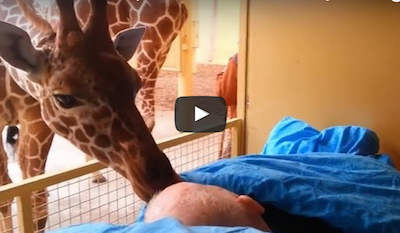 Dying Zoo Worker Gets Goodbye Kiss From Giraffe. A terminally ill zoo worker got a goodbye kiss from a giraffe after he was wheeled into see the zoo animals one last time. The 54-year-old mentally handicapped man named Mario had worked as a cleaner at the Rotterdam Zoo in the Netherlands for approximately 25 years. After being diagnosed with terminal cancer, he wanted to say goodbye to the animals. After Mario was brought to the zoo on a stretcher by the Dutch Ambulance Wished Foundation, one of the zoo’s giraffes reached down and nuzzled Mario for a goodbye kiss. Man Sleeps With Dead Wife For 5 Years!